On Tuesday, May 17, 30 pilots and aviation enthusiasts from the Experimental Aircraft Association’s Chapter 478 of Southern Maryland visited the University of Maryland Unmanned Aircraft Systems (UAS) Test Site for a briefing on the site's activities, a facility tour, UAS flight demonstrations, and an opportunity to try their hands at flying unmanned aircraft. Safe integration of unmanned aircraft into the National Airspace System is a primary focus of the Federal Aviation Administration and the UMD UAS Test Site. Test site operations staff, all of whom are FAA-licensed pilots with manned aviation backgrounds, were able to explain current and anticipated UAS issues regarding research areas, FAA regulations, airspace, and operations that are of mutual interest to both manned and unmanned aviators. 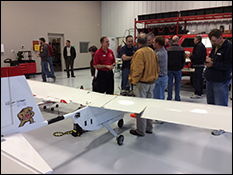 The UMD UAS Test Site views outreach to the local aviation community as a way to support the integration of unmanned aircraft operations with manned aircraft operations, and provide an effective forum for education and discussion.